We are about half an hour from landing in Dubai, after a 14 hour flight from Sydney, which departed just after 21:00 Sydney time last night. It’s been dark for the entire flight, and the sun will probably rise a bit after we land. Check in, customs, and security clearance at Sydney was quick and easy, with the airport not very busy when we arrived. We wandered the shops a bit, then had dinner at the Chinese dumpling restaurant in the departure lounge area. We had steamed vegetable buns, vegetable spring rolls, prawn dumplings, and salt and pepper squid. We boarded the plane well before departure, and found ourselves on the lower deck right near the front of the plane, only four rows back from the cockpit. All the first and business class is presumably upstairs, where from the bottom of the staircase near us we can see the liquor bar up there. The seats are wide and comfortable, with plenty of space for legroom, which is nice. And the entertainment system is amazing, with a thousand or so movies, TV shows, and music albums to choose from. And the touch screens actually work, unlike all the others I’ve seen on planes before. We were served a dinner, for which M. got a vegan meal which had some sort of grainy potato cakes with vegetables. I chose the fish dinner which was chunks of battered and fried fish in a sweet and sour sauce with rice. With it I had some white wine, which was a Semillon-Sauvignon Blanc blend from Bordeaux. The food was quite good, and the bread roll was the best I’ve ever had on a flight. After that it was the long haul of the mid-flight. We tried to sleep as much as we could, though first we watched a movie each. I chose The Muppets, which I hadn’t seen before and which was pretty good for any Muppets fan. In the middle of the night when most people were asleep with their screens turned off, M. went for a toilet break. She held on to seats along the way for balance and accidentally touched everyone’s screens as she went turning them on and leaving a trail of brightly lit screens behind her. Thankfully they didn’t seem to wake anyone up and I turned them off again. I think we missed the mid-flight snack. Breakfast was served about three hours before landing. I had a frittata which came with mushrooms and baked beans. We are waiting for our connecting flight to Casablanca, which leaves in another hour. Our flight landed here just before 05:00, when the outside temperature was a very warm 29°C. We went through the transfer security check and ended up in terminal A, which is where our next flight leaves from, so we didn’t have to travel to one of the other terminals by the shuttle train. We walked around, looking at the various airport shops for a bit, before sitting to rest and wait. We saw some camel milk chocolate, which I might buy some of on our way back through coming home. I tried to get onto the free airport WiFi, but it doesn’t want to connect for some reason. M. got a milky mocha drink from a Starbucks, and we each ate one of the chocolate chip oat bars we brought from home for travel snacks. The sun has just come up outside and our next flight is during daylight. We are a bit over halfway through the second flight, high over the Mediterranean, just south of the Ionian Sea between Greece and Italy. Our trajectory took us over northern Egypt, and a direct route would have taken us over Libya, but the flight map shows an obvious curving detour to the north to avoid flying over that country. We were given a continental breakfast of croissants and fruit after take off, with a sweet orange muffin for me and a bread roll for M. We’ll get a lunch before landing. The menu says it is chickpea and sweet corn salad with iceberg lettuce and chicken pastrami, followed by a choice between chicken machbous, marinated in distinctive aromatic spices and slow cooked with rice, garnished with roasted pine nuts, or lamb apricot tajine served with red and yellow couscous. I think I will try the lamb. Oh and a chocolate walnut brownie for dessert. Our estimated arrival time in Casablanca is 12:24. We expect to be met by a representative of Intrepid Travel, who will take us to our hotel and let us know the details for the beginning of our tour. Then we just need to stay awake for the rest of the day before having a good long sleep later. 17:49. Hotel Les Saisons, Casablanca. We are resting before an early dinner tonight, followed by an early night to catch up on sleep and hopefully kill any jetlag. Our flight landed just after 12:30 and we got off quickly because we were again near the front of the plane, this time just behind business class on the 777. The queues at customs were short and we were through fairly quickly. My bag was already on the carousel waiting to be claimed, but M.’s took a few minutes to arrive. From there we took our bags towards the exit, only to have an official wave us towards an x-ray machine, which scanned our bags before we could exit the terminal. We emerged from a door marked Terminal 2, and looked in vain for the person from Intrepid who was supposed to meet us. I noticed a display board outside directed greeters that our flight would be emerging from Terminal 1. So we walked down fifty metres or so where Terminal 1 was marked and there was another exit from the baggage collection hall there. After a couple of minutes of searching, M. spotted a guy holding a sign with a very modestly sized Intrepid logo on it, along with the logos of two other tour companies. We introduced ourselves and he had our details on a sheet of paper, but then he said he was waiting for six people, so we had to wait a little for the others to arrive. An older lady spotted the same fellow, and then another lady also travelling alone, bringing us up to four. The other two ladies were from Melbourne and Sydney. The four of us waited for the two stragglers, but after half an hour or so they never showed up. I used the time to withdraw some Moroccan dirhams from an ATM, and one lady tried to get a local SIM card for her phone from a kiosk in the terminal. The same lady also discovered her luggage had been searched – the contents rifled through and disordered. Eventually the guy got on his phone and arranged for another person to come to the airport and wait for the final pair, while he took us to our hotel. The temperature outside was hot, with the sun beating down out of a cloudless sky. The driver led us to a black van, roasting in the sun, and loaded our bags for us. We got in and turned the air conditioning up to high to cool ourselves down as we drove along a toll motorway to the city. The landscape around Casablanca looks very brown and dry, with lots of date palms and some other scraggly looking brownish trees scattered around. We arrived at the Hotel Les Saisons after about a half hour drive, and checked in. There was no information on our tour at the desk, so we still have no idea what time we are meeting up tomorrow. The hotel seems a bit run down, but reasonably well kept and clean. Our room is huge, with a large entry area and closet, and a huge bedroom, though the bathroom is a little small. The view from the window is nothing to write about, just a dusty side street and run down building opposite. View out the window of our room at Hotel Les Saisons. 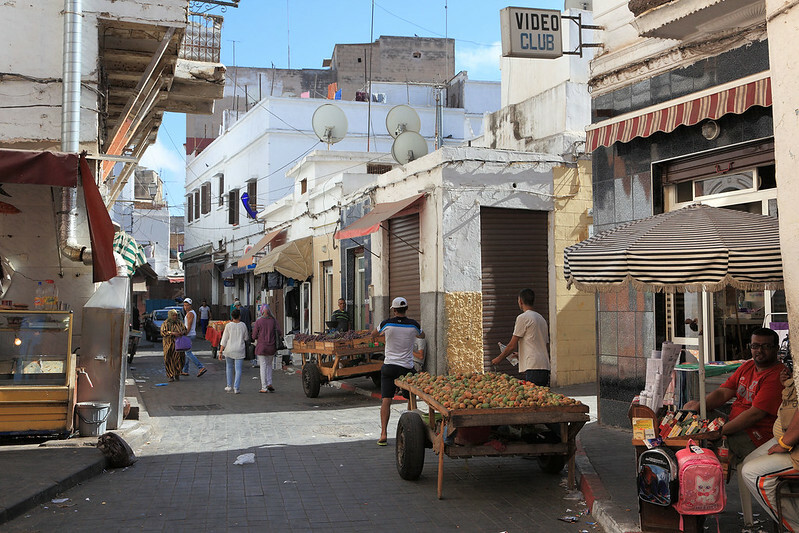 After washing our faces, we set out to have a quick look at the old medina, which is across a main road from our hotel. We entered the nearest gate and found ourselves in a maze of narrow sinuous alleyways, full of shops and cafes and the odd hotel or two. There were fruit vendors selling from carts piled high with bananas and apples and dates and prickly pears. After a while these petered out and the medina turned into a residential area, full of kids playing in the streets. The narrowness of the alleys didn’t stop motorbikes from roaring down them faster than was really advisable given the density of pedestrians. There were also bicycles, guys pulling trolleys, then tuk-tuks, and eventually in the more residential areas small cars squeezing between the tightly packed buildings. The residential areas got a bit labyrinthine and we almost got lost, but kept on heading roughly northwards, guided by the sun. Eventually we resorted to checking the map and GPS on M.’s phone, only to discover we were only halfway through the medina, when we thought we must nearly be at the northern end of it. Helped by this, and checking once or twice more for bearings, we eventually emerged right next to Rick’s Cafe, our goal. Boys cooling down at a fountain. The cafe was closed, and a sign stated it opened for dinner at 18:30. It was only 16:30 now, and we were pretty exhausted, rather than explore for another two hours, we headed straight back to our hotel to rest, stopping briefly to look at Cafe Maure and Casablanca Jose as candidates for dinner, and then to look at the bazaar stalls outside the southern wall of the medina near our hotel. We also stopped in at a convenience store right around the corner to buy two bottles of water, which cost a mere 12 dirhams for the two. We’ve since decided to head out to Rick’s for dinner, catching a taxi there at 18:30. 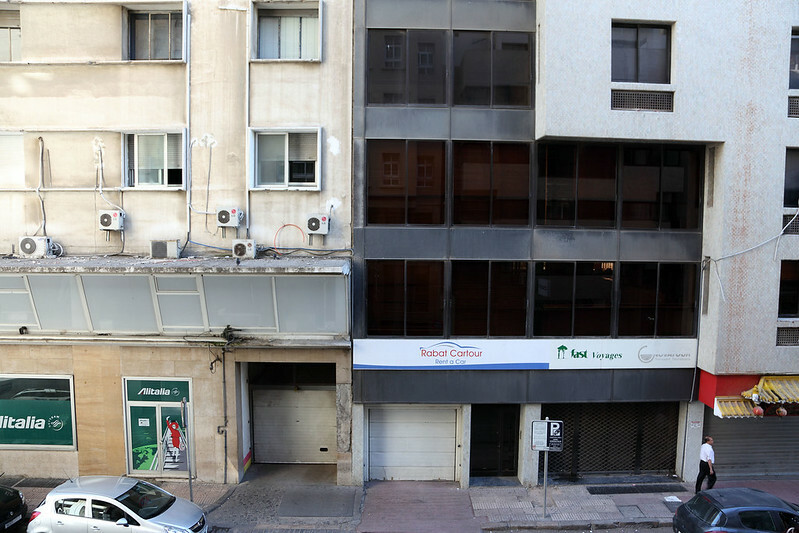 I asked the hotel reception guy to make a booking for us, but he said we didn’t need one – nobody in Casablanca takes bookings, he said, it’s too much work. We have just returned from Rick’s and M. is having a shower before I also have one and we drop into bed for some well-earned sleep. The hotel receptionist told us a taxi to Rick’s should cost only 30 to 35 dirhams. We hailed one on the street outside and I didn’t think to ask him to turn the meter on, but it turned out he had done so. The price on it was 5.80 when we got to a Ricks, which confused me and I handed the driver a 50 dirham note, which he waved away, asking if I had any small change. I gave him some of the coins which I had received in change for the water, and that satisfied him, taking about 8 dirhams worth. So the fare must have been just 5 dirhams and 80 of whatever the smaller unit is. At Rick’s we asked for a table, only to be told that we could eat at the bar if we wanted, because all the tables had been booked! Counting ourselves lucky, we agreed to eat at the bar. I ordered the sea bass with rice, while M. got a stuffed capsicum. 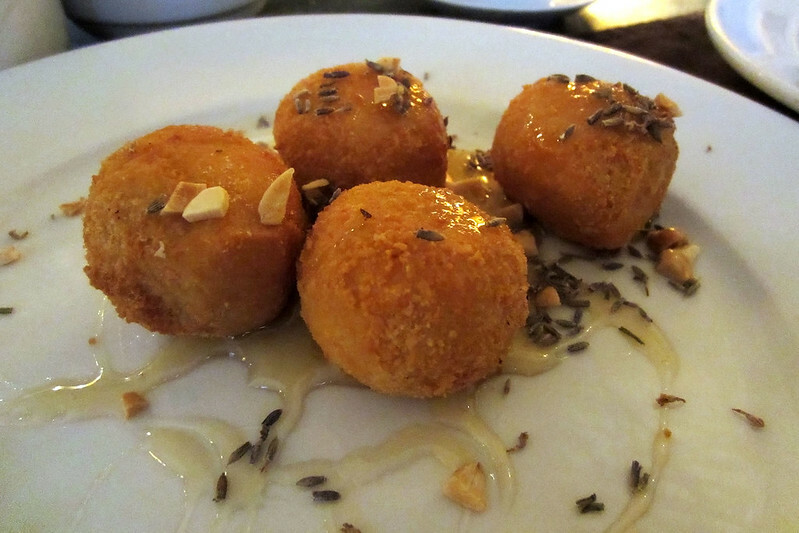 We also ordered some roast potatoes to go with it, and a starter dish of goat’s cheese fritters with honey and nuts. We were given some delicious warm bread rolls to start with, half of which had olives in them. Everything else arrived at once, and it also included a dish of mixed vegetables (carrot, zucchini, and cauliflower with herbs) and a dish of ratatouille. For drinks we had gin and tonics. Everything was pretty good, without being outstanding. The atmosphere was nice too, and as we ate several other people arrived and also were seated at the bar for dinner, despite not a single one of the “reserved” tables being filled by the time we paid our bill and left. Goat’s cheese fritters. 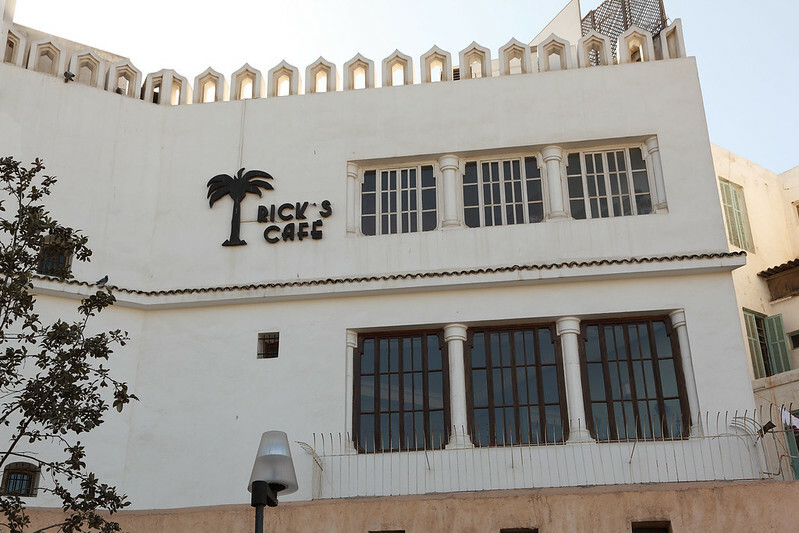 Rick’s Cafe, Casablanca. We hopped in another taxi for the short ride back to the hotel. I think this one neglected to turn on the meter, and when I handed him the smallest change I had left, a 20 dirham note, he merely thanked me and got back into the taxi. I think he was keeping an eye out for if I demanded some change, but when I didn’t, mostly because I had no idea how to do it sensibly in French, he slowly drove off. Oh well, that’s still insanely cheap for a taxi fare back home. We still don’t know what time the tour leaves tomorrow. I figure we’ll have breakfast and if nothing eventuates by 09:00, we’ll call Intrepid and see what they say. This entry was posted on Thursday, 9 October, 2014 at 21:53	and is filed under Diary, Travel. You can follow any responses to this entry through the RSS 2.0 feed. You can skip to the end and leave a response. Pinging is currently not allowed. Nice… Did Rick’s have a piano player? Yes, it did, although apparently we left too early for him to start playing. I imagine he plays As Time Goes By a lot.